Husband of Clara A. Fahey, of Rust Lane, Whanganui, North Island, N.Z. Enlisted: 3.10.1916, Show Ground Camp, Sydney, N.S.W. Embarked: 9-11-1916, Sydney N.S.W. 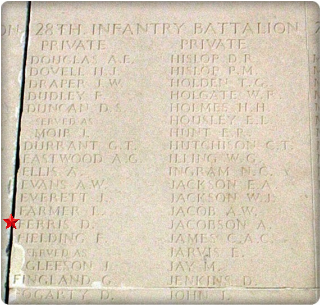 per "Beralla"
Son of John H. & Mary Ellen Fairbrother, Ballaghmore, Roscrea, Ireland. Embarked: 24-8-1916, Sydney N.S.W. 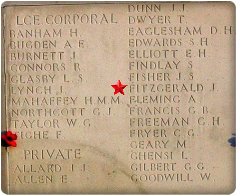 per "Anchises"
Enlisted: 9-9-1914, Rosebery Park, N.S.W. Next of Kin: Brother - John Falls, Giblett Coast Road, Manjimup, Western Aust. 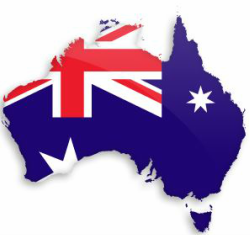 Embarked: 22-12-1915, Fremantle, western Australia per "Ajana"
Son of Adam John & Annie Faulkner, of "Yorklea", Casino, N.S.W. Husband of Bertha Ferris, Subiaco, Western Australia. Son of Robert & Emma Finlay, of 17, Linenhall St., Londonderry, Ireland. Embarked: 23-11-1916, Melbourne, Victoria per "Hororata"
Embarked: 17-1-1916, Fremantle, Western Australia per "Borda"
Embarked: 20-4-1916, Sydney, N.S.W. per S.S. "Hawkes Bay"
Embarked: 22-11-1915, Fremantle, western Australia per R.M.S. 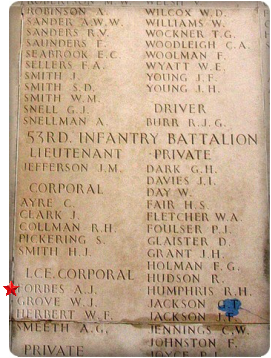 "Mongolia"
Gunner James Michael FITZPATRICK 5916 M.M. Son of Thomas and Margaret Fitzpatrick. Husband of Olive Fitzsimons, of "Oakdene," Mevmott St., Randwick, Sydney, N.S.W. Embarked: 2-2-1918, Sydney, N.S.W. per "Wiltshire"
Son of Jane Flack, Currington Parade, Curl Curl, N.S.W. Enlisted: 11-10-1916, Show Ground Camp, Sydney, N.S.W. Embarked: 31-10-1916, Melbourne, Victoria per "Argylshire"
Embarked: 6-6-1915, Freemantle, Western Australia per "Geelong"
Son of Joseph and Mary Flood. Son of Robert & Honora Foley, of Gallane, Rathmore, Co. Kerry, Ireland. Served Commonwealth Forces 2 years- requested discharge to join A.I.F. Son of Henry Edward and Theresa Foley. Embarked: 24-5-1915, Brisbane, Queensland per "Ascanius"
Son of Thomas & Margaret Forbes, of Lisnarrow, Dunamanagh, Co. Tyrone, Ireland. Embarked: 13-101-1915, Sydney N.S.W. per "Port Lincoln"
Next of Kin: Daughter - Miss L.E. Forrest, Paddington, Sydney, N.S.W. Informal portrait of 66 Private (Pte) George Forrest, 34th Battalion, of West Maitland, NSW; formerly of County Tyrone, Ireland. 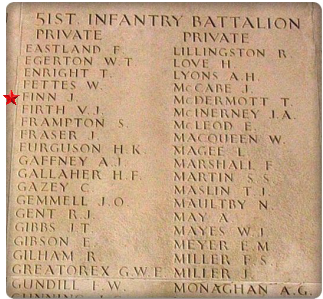 Pte Forrest was a labourer prior to enlisting in January 1916 and, as stated on his enlistment papers, a member of A Battery, NSW, for 19 years. 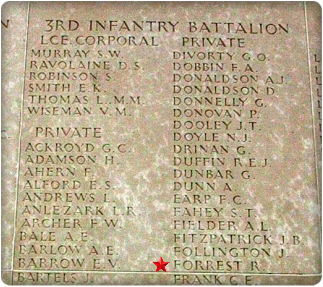 Pte Forrest gave his age at enlistment as 45 years, but he was in fact 59. He had served in the Colonial Military Forces in NSW from 1883 and, as 1090 Driver George Forrest, served in an artillery unit in the Sudan from March to June 1885. 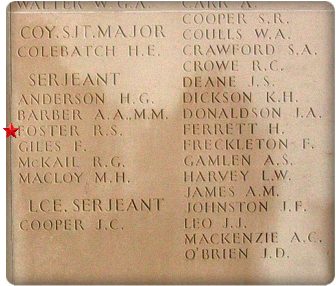 From 1899 until 1902, 1090 Gunner Forrest served in South Africa with A Battery Royal Australian Artillery. 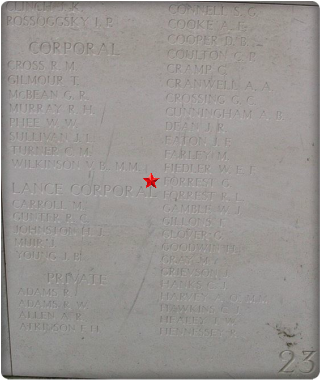 On 2 May 1916, Pte Forrest embarked from Sydney on board HMAT Hororata (A20) and arrived for service on the Western Front in November 1916. 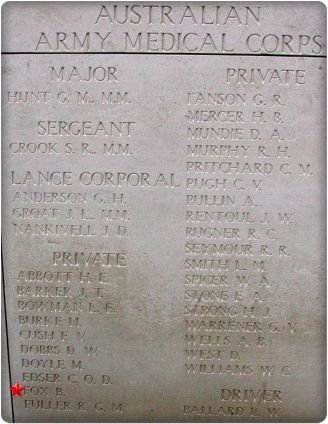 He was killed in action by a shell explosion at Messines, Belgium, shortly after commencement of the attack on 7 June 1917. He was 60 years of age. Son of Margarett Whyatt (formerly Forrest), of Gnowangerup, W.A., and the late William Forrest. Embarked: 31-3-1916, Fremantle, West Aust. 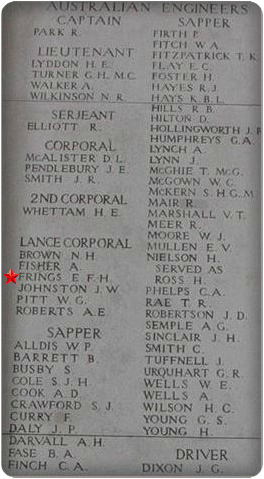 per "Shropshire"
Son of John Willie & Lily Gertrude Frings, of Brisk Island, Townsville, Queensland.